Learn to climb in the Red Rock! This climbing mecca is just minutes from downtown Las Vegas. With it’s warm weather spectacular sandstone, the Red Rock offers some of the best beginner terrain in the country. Jackson Hole Mountain Guides has nearly 40 years of experience, guiding and instructing clients in every discipline of rock climbing. Offering courses for the beginner to advanced climber, JHMG can also design special programs for corporate groups or private clubs. 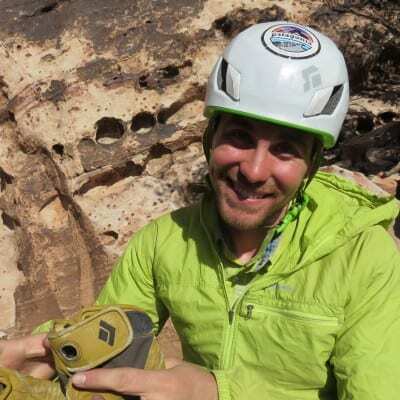 If you have never climbed or just want to brush up your basic skills, this class is for you. During this introduction to rock climbing you will learn basic climbing terminology and commands, knots, belay and rope skills, be introduced to protection and anchor systems and learn the fundamentals of climbing technique and movement. Once you experience life in the vertical world, you will be hooked! Building on the skills taught in Basic Climbing, this course gives you the tools necessary to bring your climbing to the next level. 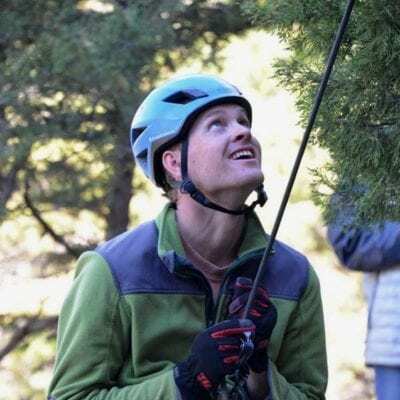 You will be introduced to and practice the climbing techniques needed to complete longer and more difficult routes, while refining your belay, rope and anchor building skills. 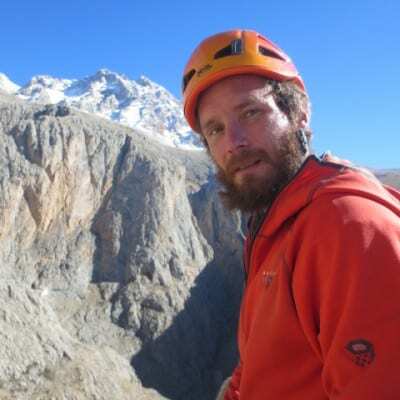 Designed for the experienced climber, this course will prepare you for lead and multi-pitch climbing while teaching techniques for “working” difficult routes, more advanced climbing movement and other advanced climbing skills. Because of scheduling, these classes cannot be booked online. Please click here to inquire about specific dates and pricing for your class. Group pricing is for 2 – 3 people on a trip. Please note that trips must reach minimum # of people. Our Red Rock office is located at 8221 West Charleston Boulevard, Suite 102, inside Desert Rock Sports. Las Vegas Airport is the closest and cheapest airport we recommend to clients. If you have any questions or would like more information, please call our Las Vegas office at 702-254-0885 or email Redrock@jhmg.com. Food: Energy Bars, fruit, sandwiches, trail mix. Bring Enough! Warm Weather – (May-Sept) The sun is intense and hydration is vital!. Hydrate the night before your climb/ hike. Consider freezing your water bottles or putting ice in them. Light colored and loose fitting clothes will help keep you cool. Cold Weather – (Nov-April) Bring gloves and a warm hat that will fit under your helmet. Bring extra layers like long underwear and a heavier winter jacket to keep warm when the sun ducks behind clouds of dips below the canyon walls. 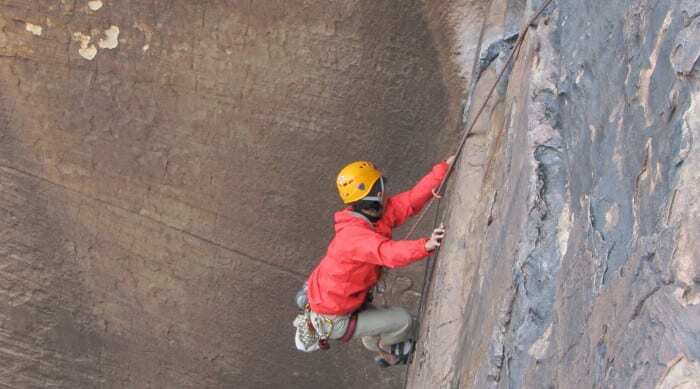 Jackson Hole Mountain Guides supplies all the rock climbing gear, harnesses, helmets, locking carabiners & belay/rappel devices. However, you are welcome to bring your own equipment. Please contact our office for gear questions. Rock shoes can be rented at JHMG. Is Red Rock a State Park or a National Park? It's neither. It is a National Conservation Area that is operated and administered by the Bureau of Land Management (BLM). The BLM is the largest administrator of public lands in the western U.S. 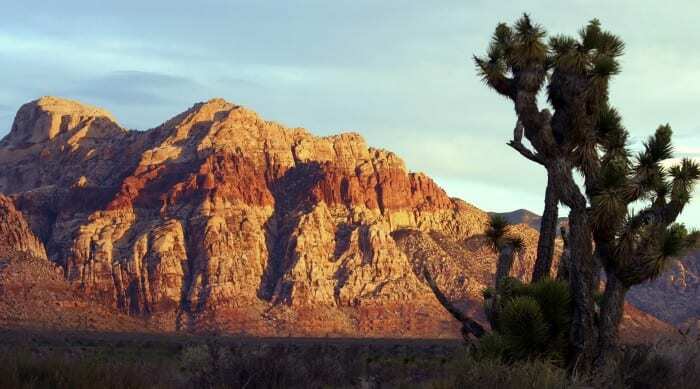 The Red Rock Canyon National Conservation Area is almost 200,000 acres of your public lands. Do I have to pay a fee to get into Red Rock? To date, there is only one fee area, the 13 Mile Scenic Drive / Visitor Center. On the days you climb with JHMG, you do not have to pay an entrance fee. Most climbing is accessed via the one-way 13 Mile Scenic Drive. When you return to Red Rock on your own, a day pass is $7, annual pass is $30 and they honor the America the Beautiful Pass ($80). Does JHMG provide transportation and will you pick us up and drop us off back down on the Strip? JHMG does not provide transportation. However, for a party of one or two, it is possible to take a cab out to our office (or other west side rendezvous venue) and guide can drive from office out to Red Rock and back to office. Depending on location of your hotel, cab fare could run $30-$50 each way. If you have more than one day to escape the Strip, we highly recommend a rental car. How far is Red Rock from the Strip? The entrance/fee booth to the Red Rock 13 Mile Scenic Drive and Visitor Center is a quick 20-30 minute drive from the Neon Jungle. Is it always hot and sunny in Red Rock? Definitely not. Red Rock is in the Spring Mountain Range and most of the climbing is located between 4000’-6000’ above sea level (Vegas = 2000’). Temperatures can vary from well below freezing in winter to well above 100(f) degrees in summer. During winter months, it is not uncommon for Red Rock to be covered in a fresh blanket of snow (2”- 8”). Fortunately, most of the snow melts within a few days. I would highly recommend taking the time to rock climb in Red Rock Canyon with JHMG service. It will be a trip to Vegas you won’t forget. The guides at JHMG are knowledgeable, experienced and will show you the best of what Red Rock has to offer. We love JHMG – we have climbed with them twice already. We could not have done this without our wonderful guides who helped us with the reservations and logistics. On both occasions, we had a unique, both challenging and fun experience. More importantly, it was very safe. So worth it! We have made many trips to climb with JHMG in Red Rocks outside of Las Vegas. Members of my family have different levels of climbing skills. Mark Limage has always considered the members of my group (it differs from year to year) and always schedules an itinerary that is enjoyable for everyone. We enjoy trying new routes and the challenges we encounter allow us to improve our skills and develop confidence. Our guides are always skilled, friendly, accommodating, and willing to teach anything we wanted to know. We have never failed to have a great time. Climbing with JHMG is a fantastic family activity. We look forward to more climbing for years to come.